If you’re familiar with my books, you know I love rhyme. I love writing in rhyme, and I love reading rhyme (good rhyme—no one likes reading the clunky stuff). I love the music, the rhythm, the sound of it. Well-written verse is just plain fun to read aloud. But not everyone wants to write in rhyme, and—truth be told—we rarely hear editors clamoring for more of it (they get too much of that clunky stuff). Still, incorporating poetic elements into your prose can strengthen your story and enhance its “read-aloudability”—something you’ll appreciate when you’re facing down that squiggly group of preschoolers during story time. So how do you add poetry to your prose? For that, we turn to Candace Fleming’s Tippy-Tippy-Tippy, Splash! (Atheneum, 2014), the third installment in her Mr. McGreely versus the bunnies saga. Here, as in the first two books—Muncha! Muncha! Muncha! (2002) and Tippy-Tippy-Tippy, Hide! (2007)—Mr. 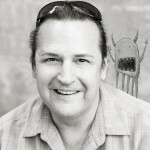 McGreely wants some peace and quiet, but three persistent bunnies keep spoiling his plans. In this latest episode, he escapes to the beach for a day—free at last!—then discovers those sneaky bunnies have tagged along. The man vs. bunny conflict offers an excellent framework for escalating drama and humor. But this is more than a great story. Thanks to the language, it’s also a joy-to-read-aloud story. Here’s a quick sampling of some poetic elements. “Mr. McGreely had bunny problems. He had bunnies in his garden. In addition to the rhyme, did you notice all the “bunnies” in that introduction? Nice, right? You might also have noticed the repetition of “muncha” and “tippy” in the titles. 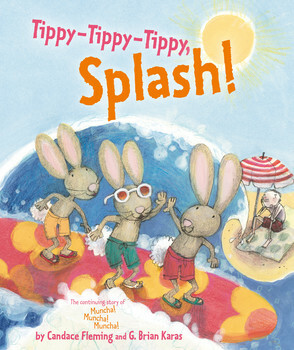 In fact, those “tippy”s—representing the pitter-patter of little bunny feet—are used as a refrain throughout the three books. So we’ve got the repetition of sounds and phrases, with a little onomatopoeia thrown in for good measure. What else? Read on. If you look at those refrains again, you’ll notice the use of both alliteration (flip/flop and click/clack) and assonance (clack/snap and plop/flop). Click to enlarge. Copyright 2014 G. Brian Karas. But he’s got other names for them as well: Infuriating flop-ears. Pesky pufftails. Naughty wigglenoses. Four-pawed show-offs. To really appreciate the poetry of these books—and the funny stories they tell—you’ll have to read them. Preferably aloud. I suspect that most writers don’t consciously set out to incorporate poetry into their prose, and I’m not suggesting you scan your manuscript looking for places to work in a few lines of rhyme or a touch of alliteration. But paying attention to the rhythm, language, and sounds in your text can make all the difference between a pretty good story and a musical one. So read your manuscripts aloud—or have someone read them to you—and keep polishing until the language sings. Are there books you find especially musical or fun to read aloud? I’d love to hear. Thanks for reading, and Happy Thanksgiving to all! Administrative note: Our email subscriptions have been a bit glitchy, but we’re working on it. In the meantime, if you’re a subscriber and think you’ve missed some posts (we post Tuesdays and Fridays), you probably have—so be sure to visit the archives. Thanks! 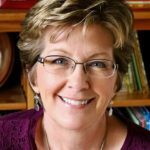 Linda Ashman is the author of more than 35 picture books, as well as The Nuts and Bolts Guide to Writing Picture Books, a “how to” e-book for picture book writers. Candace Fleming, G. Brian Karas, humor, language, Linda Ashman, Splash, Tippy-Tippy-Tippy. Bookmark. I can learn a lot from this post. Thanks so much for sharing tips to help other writers! Thanks, Linda! Hope you have a wonderful holiday! Cowa-bunnies! What a terrific and informative post, Linda, thank you! And thank YOU and your family for all the technical assistance. UGH! What a wonderful, fun and informative post! Thank you! Love this post and must go find these Tippy Tippy books!! Oh, that’s embarrassing. You may have noticed my typo (“not THAT is poetry”). I’ve fixed it now. Hopefully you knew what I meant. I’ll definitely check out those books! Love the way the rhyme works so seamlessly with the rest of the text. Yes! I think you’ll like them, Sandy. I’ll never forget the reaction I had from the kids when reading Muncha Muncha Muncha to a group of kindergarteners. I’m so glad to learn there is a new book in the series. We can learn a lot about using poetic language and techniques from these stories, for sure! Oh, I bet the kindergarteners loved Muncha! And I bet you’ll love the others too. Great post, Linda! Thank you. Thank you, Linda! What a great post and an invitation to get these books! I learn from every picture book I read, and this one looks like a keeper! So true! And, yes, definitely a keeper! Great post, Linda! Great read-alouds so often contain poetic elements. Candace’s books are always chock-full of beautifully-crafted language! Very true. I only recently discovered Oh, No!, which I love. This is a great study post. Thanks! Terrific post. I love this language, I want to eat it up and speak it out. What fun language. Thanks for all the wonderful tips! I must “tippy-tippy-tippy, dash” out to get this book! Thanks for this wonderful post. I ordered up the book and printed out this post to keep handy. Very useful stuff. Great post! Thanks for the examples! Loved this post – so very helpful as I am working on a rhyming text right now. Sometimes it flows so easily, sometimes it comes so hard – and other times, changing one word or stress throws while pages out of whack. Thanks for all the detailed tips with examples! 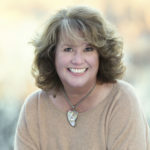 I love this post, Linda, and your praise of Candace Fleming’s poetic style. I “discovered” the McGreeley vs. bunnies books about a month ago and immediately fell in love with them. The language is so fun and entertaining. Not one wasted word on the page. Even the silly sound effects, like “Tippy-tippy-tippy, pat! 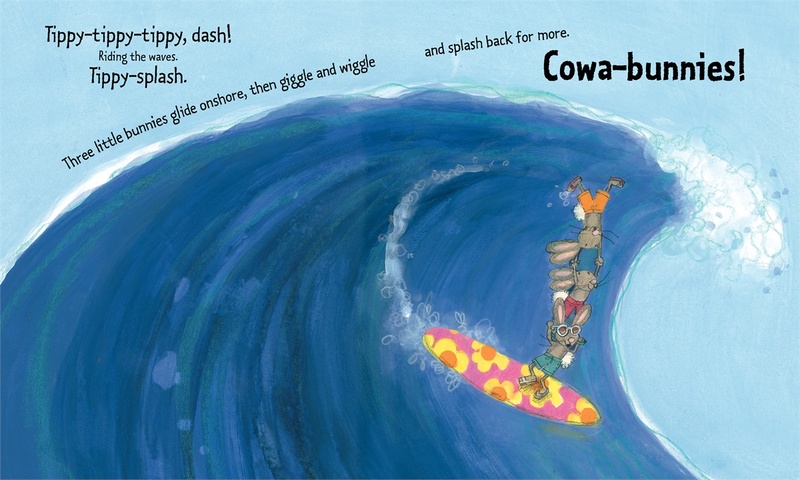 Click-clack-snap!” and “CRASH SMASH GLUB GLUB BLUB,” incorporate colorful verbs that move the story forward. Wonderful post, thank you. I especially love those bunny names!